Can you believe that the holidays are here? For many of us, the season ushers in guilty pleasures – like watching Hallmark Christmas movies. Inevitably, the impossibly gorgeous cast pales in comparison to the idyllic locals. While the main characters stroll through charming little villages, all decked out for Christmas, the romantic in us longs for a similar experience. With our first snowfall of the season in the books, even though we may not be able to promise a “kiss under the mistletoe” like Hallmark, we can offer a picturesque holiday shopping experience. 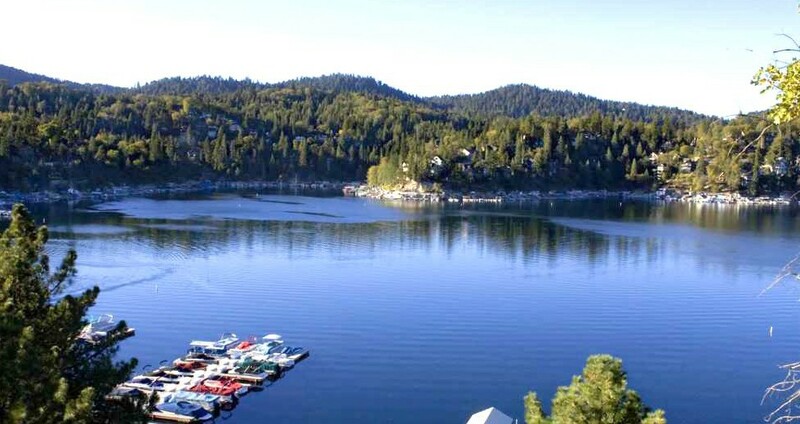 Known as “the Alps of Southern California,” Lake Arrowhead Village was built in the 20’s with a picturesque Nordic-style feel. Today, the Village is home to over 50 shops and restaurants, ranging from outlets to specialized boutiques, making it the perfect spot for checking off your holiday gift list. So you won’t just find one-of-kind items at specialty shops but can discover deals that rival or beat anything offered in the snow-free valley below. If you have a fashionista on your list, you may want to pick up a flowy top from Sondra’s/Tattle Tales, which offers stylishly unique women’s and truly adorable baby clothing. Or, perhaps a preppy sweater and button-down top from the Van Heusen outlet store would suit your more tailored friends and family members? Or think of the person on your list who is always chilly? They will love a cozy wool shirt from Pendleton Woolen Mills. Pop into Jockey to pick up matching Christmas Eve PJ’s for your entire family. The Coach outlet store always has great sales, allowing you to bring home a gorgeous new bag or wallet. With additional discounts available on many clearance items, the outlet offers more options than you would find online. Maybe you want to extend your Hallmark moment by presenting your loved one with a piece from Alpine Jewelers? For the tweens on your list, Claire’s is a popular choice. Stop into The Grapevine and scoop up a rare beer or bottle of wine for the connoisseur on your list. By the pound or piece, Rocky Mountain Chocolate Factory is a chocoholic’s holiday dream. The tea or coffee fanatic on your list, are sure to appreciate a bag from The Tea and Coffee Exchange, and you’ll want to grab yourself a peppermint hot cocoa to languidly sip as you shop, the sounds of Christmas music floating gently through the air. Mr. G’s is every bit the charming classic “Hallmark” toy store, with a diverse inventory, sure to please all the little munchkins on your list. Although we touched on just a few, Lake Arrowhead offers a wide variety of shops, all filled with ideal Christmas presents for nearly everyone on your list. What are you waiting for? Bundle up in your red coat and scarf. Don’t forget the fluffy white vegan fur hat! And shop! Whether you’re looking to spend two nights of luxury with 20 of your closest friends, or you’d prefer to stay in a modest cabin, at Arrowhead Property Rental in Lake Arrowhead, California, whatever your “Hallmark dream” is, we offer lodging to fit all tastes and budgets. For individuals, couples, families and groups, with stays of days, weeks, or months, we have what you need — all at great prices, with unbelievable amenities. Check out the possibilities. Holiday rentals fill up quickly. Don’t delay. Book today. Are you worried about a mountain getaway derailing your healthy lifestyle? Going on vacation doesn’t need to equate to a hiatus from your fitness routine. In fact, you may find that the higher elevation in Lake Arrowhead adds an extra challenge to your existing regimen. Vacationing in the Lake Arrowhead mountains provides not only a much-needed respite from the heat in the valleys below, but a multitude of other health-related benefits. The color green, in plentiful supply due to our trees and ample mountain foliage, is known to be restful to the eyes, and calming for the mind. You’ve probably heard that looking at something green is helpful for tired eyes. Imagine what a mountain vacation does for strained eyes and frazzled nerves. At over 5000’ elevation, Lake Arrowhead is a perfect place for revving up the old metabolism, assuming you can say “no” to the haystacks at Jensen’s Market. The benefits of crisp, clean mountain air extend beyond the relief your grateful lungs receive; Lake Arrowhead’s forests are filled with pine and cedar trees, both of which have healing properties. The scent of pine or cedar can eliminate depression and lower stress. Additionally, the aroma of cedar is effective in helping with insomnia. Vacationing in Lake Arrowhead is fun and affordable anytime of the year, but as summer dips into fall, you can’t improve on the beauty of the San Bernardino Mountains. Whether you’re looking to spend two nights of luxury with 20 of your closest friends, or you’d prefer to stay in a modest cabin, at Arrowhead Property Rental in Lake Arrowhead, California, we offer lodging to fit all tastes and budgets. For individuals, couples, families and groups, with stays of days, weeks, or months, we have what you need — all at great prices, with unbelievable amenities. Check out the possibilities. Don’t delay. Book today. Think it’s hot now? Just wait: Southern California’s heat wave is just getting started. Do you own property in the Lake Arrowhead area that you would like to rent out this summer? Do you wonder about appropriate rates to charge and how to get the word out? Do you need help setting up boundaries for rental guests?